I am a big fan of Lovecraft’s works. The rich history of his cosmic horror has always fascinated me. Cthulhu is one of his most popular creations. This is one Ancient One with an exciting past. Cthulhu, in the mythos, was conceived on the planet Vhrool in the 23rd cloud from Nug and Yeb. At some later direct he went toward the green double star arrangement of Xoth, where he mated with Idh-yaa, and was later venerated by the shape-moving starspawn. Idh-yaa later produced four youngsters: Gthanothoa, Ythogtha, Zoth-ommog and Cthylla. 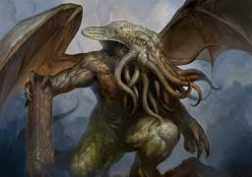 Cthulhu and his family, and also his starspawn, ventured out to Earth where Cthulhu mated with his sister Kassogtha, who generated Nctosa and Nocathulu. Cthulhu and his children then assembled the immense green stone city of R’lyeh on the colossal indented mainland of Mu, before it was annihilated by Ythogtha. Learn More about Cuthulhu in The Call of Cuthulhu. I write cosmic horror myself. Join my mailing list for a free ebook that’s not on Amazon. I will only email you when I have other free offers on my eBooks.